Searching for a safe way to store your tablets? 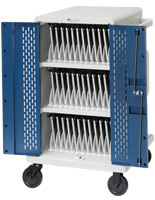 Secure iPad lockers are the perfect charging storage solution. There is nothing more annoying than wanting to start your work, but your electronics have no charge because they were locked away to keep them away from sticky fingers. 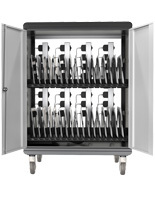 With our smart iPad lockers you’ll find an all-in-one storage solution: keep your mobile devices safe, charge them at the same time and have immediate access whenever you need it. Sounds perfect, doesn’t it? Live easy. There are more important things to worry about than a tablet with a low battery. 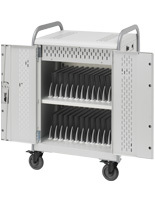 Displays2Go offers a great selection of iPad lockers that can hold up to 42 electronics. 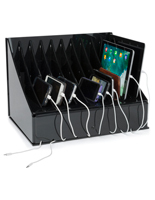 Besides iPads, the lockable charging kiosks can hold any kind of tablet, smartphones, laptops and notebooks. Select a locker that fits your preferences. Want your mobile devices readily available in your school classroom or shop? A trolley with wheels could be the right choice. Limited floor space? Choose a cabinet for the wall. There are many different possibilities available to suit your needs. 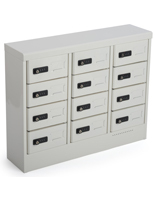 What features are available for lockable storage cabinets? 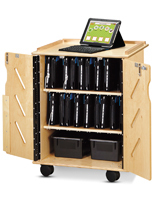 Placement Style: Be flexible with varying placement styles for iPad lockers. We offer storage stations that are floor standing, some that can be wall mounted and others that can be placed on a counter or table. 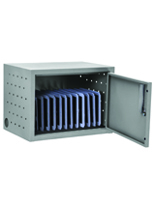 Ventilation System: Lots of storage cabinets are provided with ventilated sides to keep your devices at a safe temperature and prevent them from overheating. 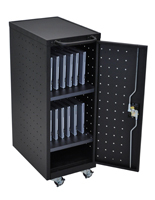 Locking: The charging storage solutions come with a lock and key system or a combination pad lock. Decide whether you need a more public solution letting your customer lock their mobile devices with a code or if you’re comfortable handing the keys to someone you trust providing them access to your property. 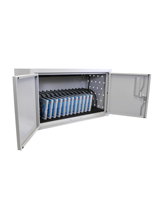 Cable Management: To make loading as easy as possible the charging cabinets come with multi headed cables that are kept organized and out of sight in the back. Shelves & Dividers: Shelves give more space for the devices and some of them are adjustable to be more flexible in which electronics you store. Rubber-coated dividers secure your tablets, laptops and smartphones and ensure they are free from scratches or damage. Power Distribution: There are different ways to charge your electronics. 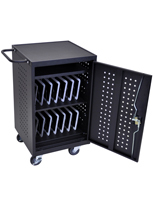 Some of our carts feature a scheduled power surge center that allows you to control how long and at what time your smartphones, laptops and devices start to charge. Others come with a power management system that enables juicing up devices with a low battery. There are also controlled power management systems that charge each row for 15 minutes and then switch to the next row. This prevents your tablets from overloading. Mobility: We offer lots of mobile trolleys with casters that give you the possibility to transport your devices from one room to another easily. In most cases two wheels are lockable to give your cart a stable stand once positioned where you like it. The areas of application of tablet kiosk stands are many. No one likes losing battery life and everyone wants to prevent their mobile device from theft. 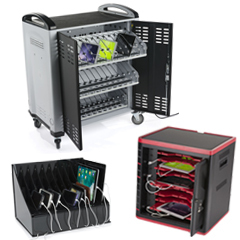 Multi device charging stations are used in schools as mobile classroom carts, education centers, labs, libraries, hospitals, retail stores, hotels, restaurants, offices as well as public events. 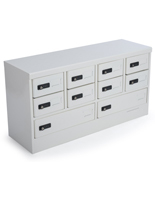 Concentrate on your work or make your customers happy with a charged tablet by using these storage cabinets. Displays2Go is an eCommerce Shop for in-stock trade show and custom POP Displays. We offer a wide selection of trade show booths, poster frames, banner stands, mounts and more. Give your customers a great experience using high quality customized products for your trade show booths, waiting room or office.